This post may divide some of you. perhaps it’s a love or a hate kind of a thing – it will be interesting to find out! When I first saw these Fauxidermy mounted toy animal heads.. I have to admit, I wasn’t entirely sure at first….did I like them or was I mildly disturbed? But the more I actually saw of them, the more they grew on me and the more I got to like them. Now I am fully decided that they are very special and I wanted to share my discovery with you! 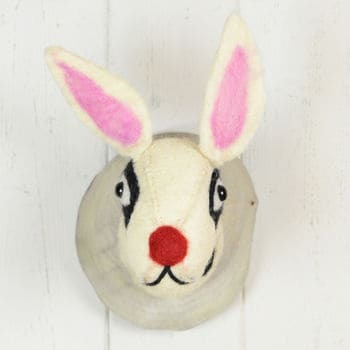 I’d never heard of the term Fauxidermy before discovering these toy head decorations, but I think its a pretty good description. I am NOT a fan whatsoever of the real thing and I’m not a particular a fan of the regular adult Faux animal head plaques that appear to be very popular now, normally created in metal, plastic or wood! However, these fluffy creations to me, are of course something different altogether. Perhaps one reason for this is these Toy heads seem very much alive, they have great character and a friendly warmth to them. There are many different animal head plaques to be discovered, a large variation available in different styles – they are certainly unique stuffed animal toys and not something I was aware existed until very recently. I think they’re going to become very popular! 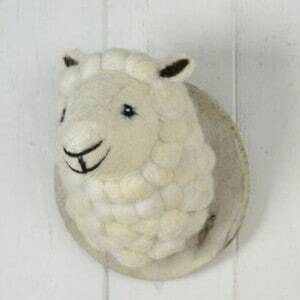 This Home & Glory Fairtrade Felt Sheep Head looks pretty content, with a sweet look on his face. I adore the fluffy wool detail, it’s just perfectly done. But it doesn’t all end at one Sheep’s head, oh no, there are many more of these creations! Some do seem to get rather unusual…. Apparently, this is actually a Spotty Dog …I was fairly certain it was a rabbit. 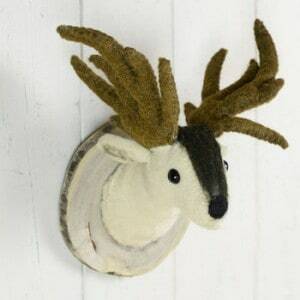 How about this more traditional looking Home & Glory Reindeer Felt Animal Head – Pretty cute I think? I love the antlers. Whatever you may think of these animal heads, they have been created with some lovely detailing. This is one of my favorites! 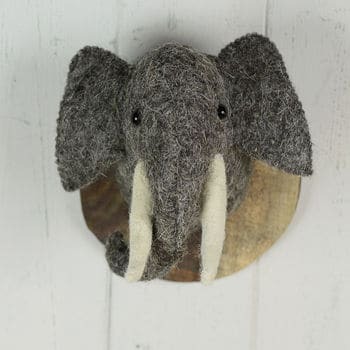 The Home & Glory Fairtrade Felt Elephant Head . The Elephant really looks wonderful, the texture of the grey wool and the long tusks with a curly trunk – he does look like a handsome Elephant! 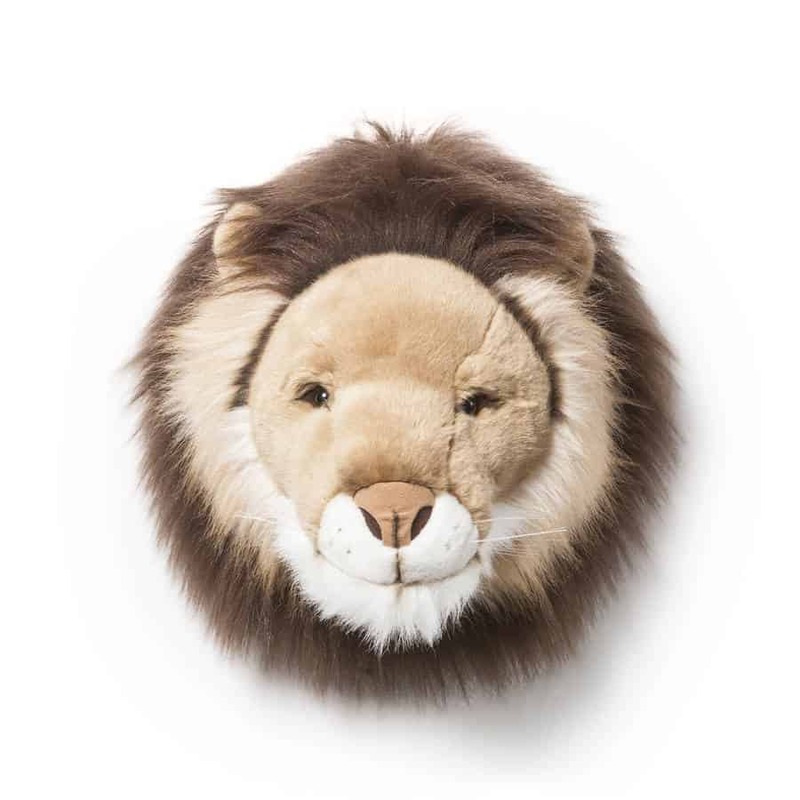 This Diddywear Decorative Animal Head Lion is absolutely stunning. This Lion’s fluffy mane is beautiful and the detailing in his face is so delicately done. He has a lovely friendly feel about him. 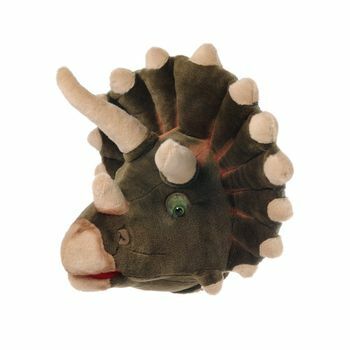 This Diddywear Dinosaur Decorative Animal Trophy Head takes it to another level still. Check out the detail in this guy! He’s absolutely gorgeous and if you’re working on a Dinosaur themed room, this would really make a superb feature for the room. 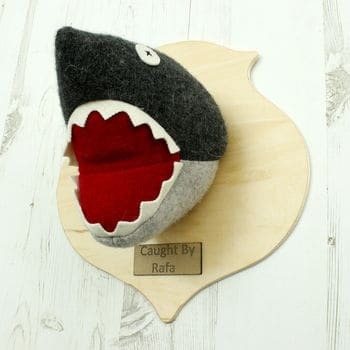 They do get more comical… This green tulip ethical living Upcycled Shark wall plaque is brilliant fun and if you can read the underneath plaque it reads “caught by Rafa”…so, you can customise these, which I think is a lovely touch. Yes! It’s a Unicorn! Not only that, but a Unicorn with a pink and swirly horn, I love this design. This pink and white wool unicorn toy plaque would add a special touch to any Unicorn fanatics dream bedroom. Better yet, both this Unicorn and the Shark are made from recycled wool and they are also individually handmade and no two are identical. Any of these animal heads would certainly make a unique gift, or indeed a unique decoration for your own child’s bedroom! There are also other toy animal heads available that are very special too and worth checking out. The price range varies, but prices range between £16 and £80. So, certainly a huge variation in price. However, this also shows that you can pick up a quality product here, whatever your budget. Isn’t she magnificent? She would certainly make many a Unicorn fans dreams come true. 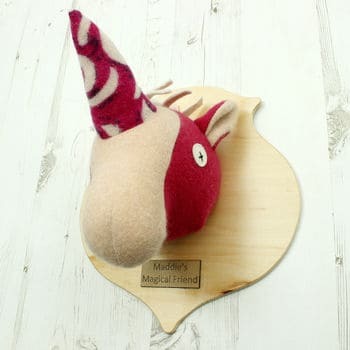 You can purchase this beautiful Fauxidermy Unicorn on the wonderful ETSY platform. It’s a large piece – measuring 75cm from the top of the horn to the neck! You can just see the amount of effort and detail that has gone into her creation and for something extra special, she is certainly worth the price tag, (around £500). 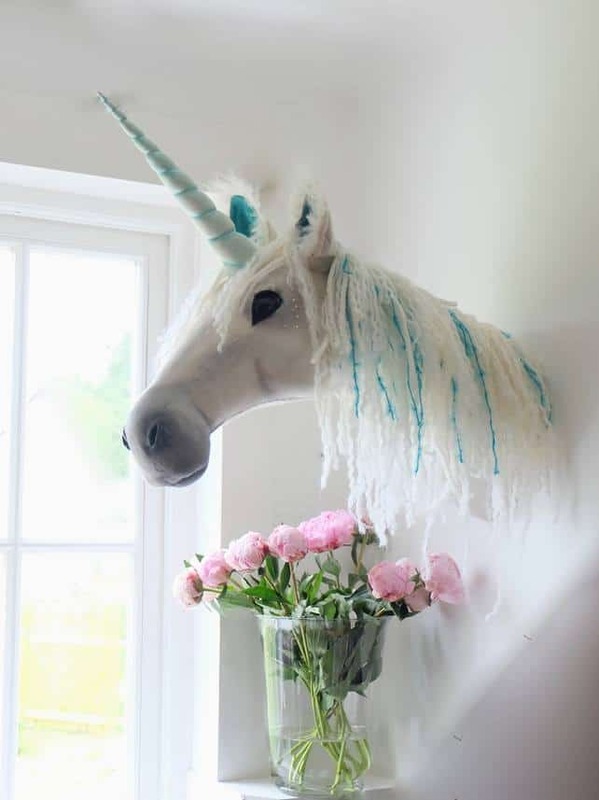 A unicorn wall plaque would work perfectly in a themed room with Unicorn Wall Stickers – Check some out here. So, which of these Toy Animal Heads, (Or Fauxidermy heads) are your favourite? Go ahead and leave me a comment! I love this post so much. I didnâ€™t even like animal heads but after viewing your article I changed my mind. These are so cool. And itâ€™s nice to hear about your favorites. Mine would definitely be the dinosaur (triceratops, Iâ€™m a big dinosaur fan lol) and the shark with the with the plaque. I want one now! Ordering straight away! OMG I love them! I have never seen toy animal heads before. And yes, the “spotty dog” is definitely a cross between a rabbit and rudolph. I also checked out your sales page and fell in love with the white elephant for $999.95. I think I will have to save my penny’s for sure. I’ve only recently discovered them as well Sheri, I’m really pleased you like them. There are some brilliant ones, I hope you get around to making those savings and get the one you want. How cute are these, so different to the normal stuffed animal heads, I find those gross! I especially like the sheep head, looks so friendly. I was trying to check how much it cost, but the link took me to the general website, Please add a link to the sheep head, I love it! The first time I ever came across it, is right here on your site.Guess I learned something new, thanks for that. Personally, I would go for this.It would make it easier for me to teach my kids about animals.I will use them as a springboard to discuss the importance to have respect and care for these animals. My favorite is the lion, probably because I am a Leo.Is this one made of recycled material too? Ok, I am with you – at first I was thinking “there is no way I will like this” but as I went through some of the picture, I found a few I actually think are adorable! I was never into the whole “hunting” theme for a kids room (though I know plenty of people who are) and the more traditional animals would certainly interest them! 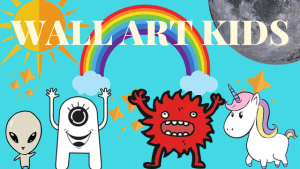 But I think the elephant, lion, unicorn, etc would just bring a kids room alive! I’m not a fan of it looking “mounted” so I think thats why I leaned toward those. And that huge unicorn! A little girls dream! Heck, I might mount that in my room haha. Great article! Very unique items! Thank you for sharing! Those are adorable! I would have loved that unicorn when I was little. The deer and elephant are probably my favorite. I love that they are made of felt with a wood backing. They would go great in a little kid’s room with either woodland dÃ©cor for the deer or a jungle theme for the elephant. I never decorated my kids’ room, but I always wanted to. These would have been great!